When I look at my sidebar, I get so excited about the pretty buttons of sponsors and other bloggers that I love being right there! I often click on these sidebar buttons to be quickly taken to these sites to see the newest posts or information that might be up. I think the sponsorship buttons are great because they help us to connect with different and amazing ideas. I just love the engagement and fellowship that comes from mingling with other bloggers. Would you like to swap blog buttons with me for this next month? I would love to check out your site by clicking your button and encouraging my readers to do the same! If you are a blogger or small business owner and would like to swap blog buttons, please contact me! I can’t wait to hear from you! If you don’t want to do a blog swap, but you are still interested in helping to sponsor Spoonful of Imagination you can buy one of the following buttons/add spaces for my sidebar. 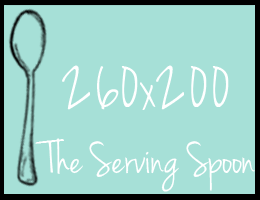 My first option is The Serving Spoon ($15) for this 260 x 200 add space. My second option is The Tablespoon ($10) for this 260 x 120 add space. My last option is The Teaspoon ($5) for this 125 x 125 add space. Each of these options allow your button to be up for a month. You also have the opportunity to do a guest post or giveaway if you are interested!